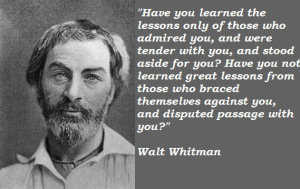 Thanks to Walt Whitman and Jenni for this message. This image is courtesy of RUGU and speaks very loudly to me today. Whitman clearly understood something that most take far too long to appreciate, I know I did and paid for that time wasted dearly. He intuited that it is not the choices made in comfort and ease alone that creates strength, will and provides us with the impetus to grow. We define ourselves by ALL the choices made but when we contest with others who would write the lines of our life’s play THEN we discover the path that WE would take through life and the lessons from which we will grow. Today, I have experienced a number of reminders of suffering – some large-scale, such as the 25th anniversary of the Tiananmen Square massacre, some personal, such as hearing of the death of the sister of a friend, who had been caring for her as she died of breast cancer. As difficult as it is to suffer oneself, it is also difficult to witness suffering – especially if the sufferer is someone you love, someone you want to protect. You want so much to make their suffering stop, even though it is impossible to do. I am reminded of the times in my life when I have been confronted with the suffering of a loved one, which have, unfortunately, taken up more years than I care to dwell on here. I wish I had some great wisdom to pass on, but I’m afraid all I can say is that it is important to be available to the one who is suffering and to listen to them, whether that means hearing them speak, intuiting the meaning behind their words, or reading their body language. I think it also helps to concentrate on the other person, even though that may mean setting aside one’s own worries, sadness, and fears. The one who is suffering has enough to deal with without adding to their pain by their worrying about you. You can take time on your own later to process the worries, sadness, and fears. Sometimes that happens later in the day or week, when you find some time and space of your own to reflect. Sometimes, it is years later when something reminds you of that period of time when your loved one was suffering. One of the happy side effects of having OM reblog one of my posts is that I get visits from other cool blogs, like this one, which I am now following. I am happy to know that Sergeant Bowe Bergdahl, who has been the only US prisoner of war in Afghanistan for the past five years, is back in the hands of the United States armed forces. I’m glad that he will be returned to his relieved parents after he has recovered from his long imprisonment. I am, however, dismayed by the people who are saying that he should not have been exchanged for five prisoners that the US had been holding in Guantanamo. Exchanging prisoners of war is a long-standing practice, especially near the end of the war, which is approaching quickly from the perspective of US involvement. The problem is that, due to the machinations of President George W. Bush’s administration, many people do not consider these five men as prisoners of war, instead categorizing them as”detainees” or “enemy combatants.” In this way, they have skirted international law about how prisoners of war are to be treated and blocked moves to release them or even bring them to trial. This shameful behavior has to stop. Prisoners of war have to be called prisoners of war and justly treated as such, in accord with international treaties to which the US is a signatory. Congress, having authorized the president to conduct the war, should not intervene as they have been doing in what is essentially a military matter to be handled by the chain of command up to the commander-in-chief. The other issue that critics are lamenting is that the United States negotiated with terrorists. However, the exchange was negotiated through a third party, the government of Qatar. The US did not directly negotiate with the Taliban. The US did not release the prisoners to the Taliban. Again, we have a problem with words and with history. The war in Afghanistan was fought against the Taliban, which was the ruling party at the time, because they were sheltering Al-Qaeda. Al-Qaeda was the terrorist organization against which the US-led coalition was fighting; the Taliban was the ruling party of the country in which many Al-Qaeda members were hiding. The Taliban who became US prisoners were fighting for the government of Afghanistan; while it fits the narrative of critics of the current administration to portray them as terrorists now, it doesn’t fit the fact that these five men were part of the ruling government of Afghanistan, which should make them prisoners of war. Although the Taliban no longer rules Afghanistan, it doesn’t change the fact that they once did. I am sorry that some people are marring what should be a time of relief and joy for Bowe’s family, his hometown in Idaho, and the country. It’s time for all of us in the United States to pull together and help heal the wounds of war. We owe it to those who have been deployed so long and so many times to celebrate their service to our country and find peace back home. This June marks the end of an era for me. Since my older daughter began singing in the youth choir at church when she was in third grade, one or both of my daughters have been singing in choir, cantoring, and/or ringing handbells nearly all the years that they were living at home. With my younger daughter scheduled to move away to begin graduate school in August and no likelihood of her or her sister living in our hometown again, after this month, I will not hear them singing or ringing on a regular basis. Of course, I have heard them sing in other places: elementary, middle, and high schools; Gettysburg College; Cornell University; even Carnegie Hall in NYC. I’ve heard my older daughter sing at her now home parish in Honolulu. My younger daughter is hoping to find a chorus in which to sing while she is in grad school, which is only about a 90 minute drive, definitely close enough for concert attendance. I’ve actually extended the era of hearing them sing in our church longer than anticipated, with my younger daughter living at home for two years while doing volunteer work and preparing for grad school, affording her the opportunity to sing for the first time with an adult, rather than youth or teen, church choir, and to join the new handbell choir at our current parish. She and her sister had both rung in the parish where they were baptized, which is now closed; she had missed ringing, so the new bell choir was a tremendous blessing for her personally, as well as for the parish. While I don’t foresee a circumstance where our daughters would live here, it is possible that at some future point – after we are retired, perhaps – we might live near one or both of them and again get to hear their voices raised in song at church on a regular basis. I don’t know what the future holds, but I will try to cherish these last few times, hearing my daughter ring and sing, helping us all to lift our hearts and minds to God in prayer. This is from an Austrailian blogger whom I follow. 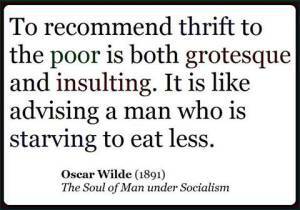 The Wilde quote applies across many times and places, including now in the US with rising poverty and income inequality while rich individuals and corporations don’t pay their fair share in taxes and receive subsidies and other tax breaks. Meanwhile, cuts are made to needed assistance for housing, food, education, and other services for the low- and middle-income folks. Thank you to Asylum Seeker Resource Center here in Australia for this quote. I find it apt considering the circumstances surrounding the current budget and even more so considering the resources you provide that should be provided by our government. So thank you for this quote and thank you for the work that you do.